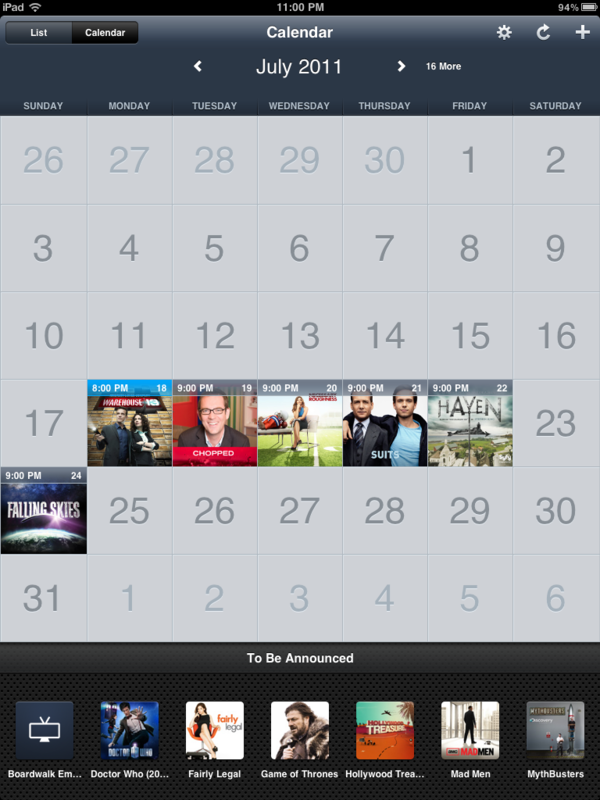 The other day I was playing on my iPad looking for some new apps to try and I stumbled across TV Forecast HD. 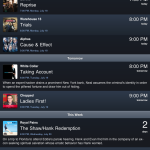 TV Forecast is an ingenious app that creates a TV guide just for you. 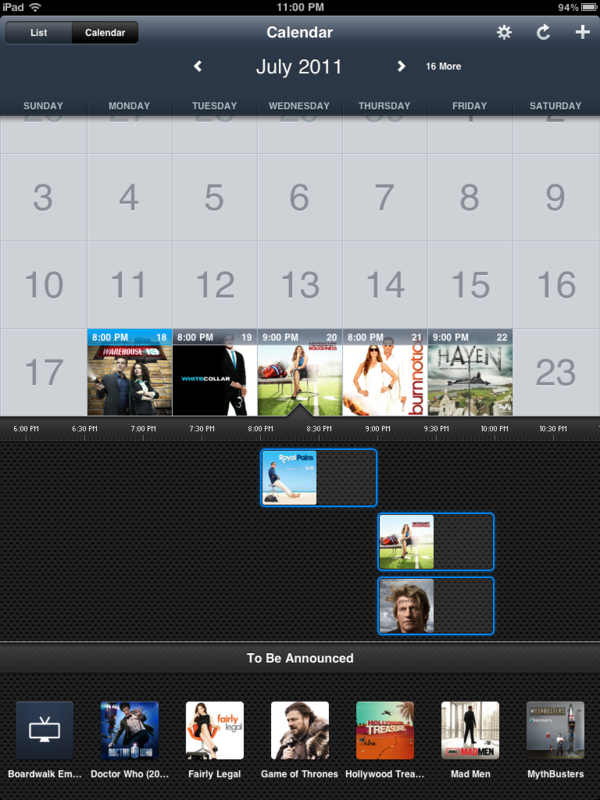 You add the shows that you want to see and TV Forecast helps you stay up to date on when your favorite shows air. 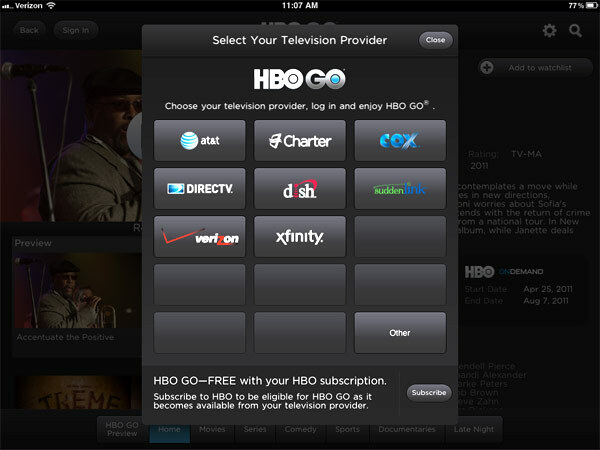 The first thing you need to do after installing the app is add your favorite TV shows. Thankfully, the process is simple. 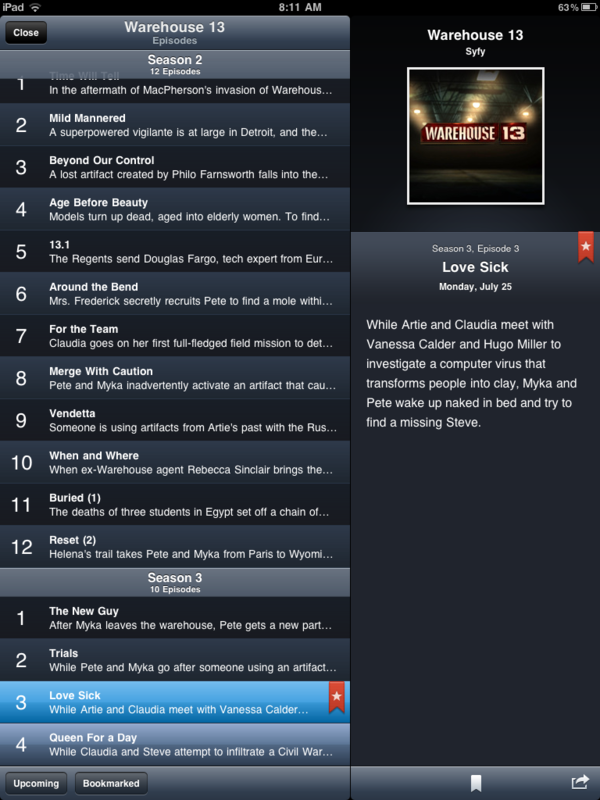 Press the + icon on the screen and search for your favorite show. 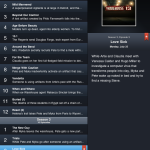 Once you find it and select it, it will take you to a screen giving a synopsis about the show, a list of episodes, and if you click on an episode, it will give you a synopsis of that specific episode. Once you have added all your favorite shows (which may take a while if you’re a TV addict like me), the app gives you two ways to view the upcoming schedule. 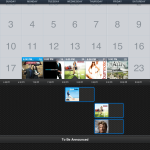 There are two views in TV Forecast, Calendar view and List view. They are pretty self explanatory. 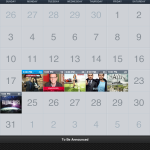 Calendar view shows you a monthly calendar with thumbnails of the shows that air each night. If you click on a day it will show you, in timeline form, all the shows that air that night. You can see what time they start and if you touch a show it will take you to the show’s profile. List view is exactly what it sounds like. It’s a list of upcoming shows organized by day and time. Again, you can touch a show to find out more about that show and episode. One of the coolest features in the app is the bookmarking feature. 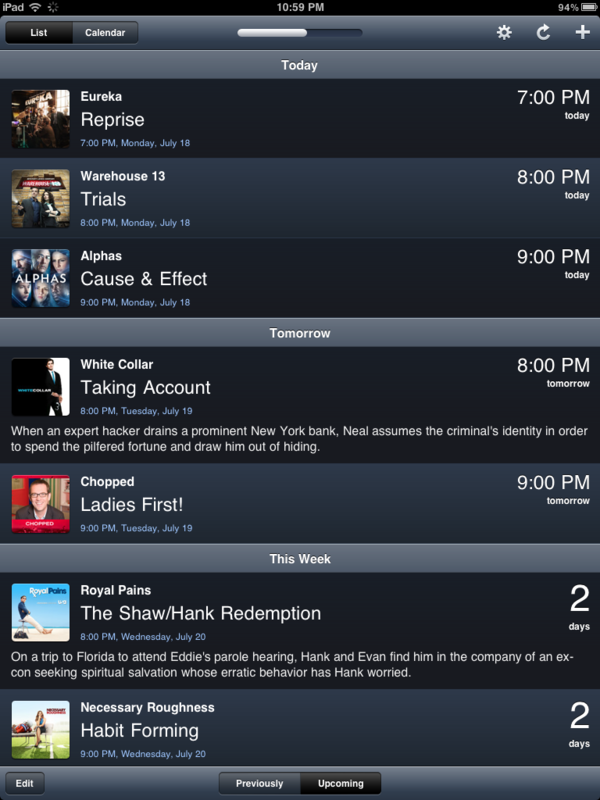 If you are like me and have several episodes of a show fill up your DVR before you get a chance to watch them, you can bookmark where you left off in the app. The bookmark will tell you that you left off on a particular episode so that you can be sure you won’t accidentally skip ahead to a future episode without watching the ones before it. Of course, your DVR should organize programs by date too, but it can be handy for people who, ahem, watch their TV using other means than traditional cable or satellite. 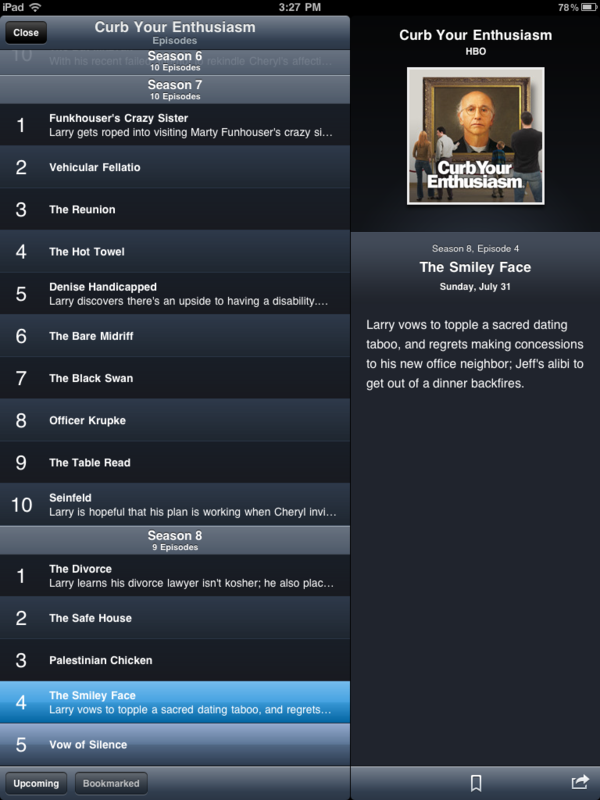 The synopsis page also allows you to read more about the show on TVRage as well as provides a link to the show in iTunes. One of the other features that might come in handy is the notification system. You can set the app to remind you of upcoming shows. The amount of time the app notifies you before the show airs is configurable. I was excited about this feature at first, but since I watch a lot of TV for this site, I was getting several notifications every hour every night. Unfortunately the notification system is app-wide and not configurable on a show by show basis. This is something that is planned for the 1.1 version of the app. You should be aware that if you’re looking for an app that will show you when the next rerun of Cheers or Seinfeld is airs, this is not the app for you. 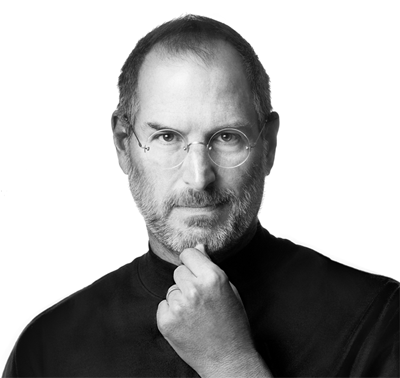 This app is intended for use with in-production series only. The bookmark feature allows you to remember where you left off in a series. 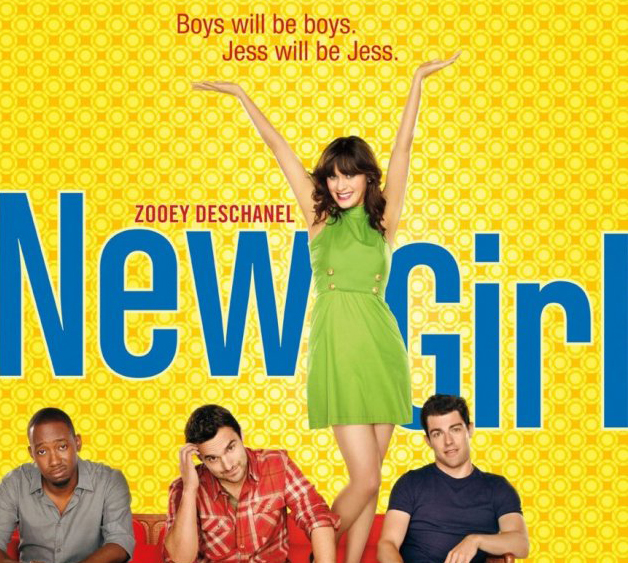 Weekender: Watch New Girl Now, Regis Philbin’s Last Show, HawthoRNe and More! Contest! Win a $50 Visa Card and Cash Cab Board Games!